Since I grew up on a mielie farm – with my dad milling his own maize meal, pap is an absolute must-have when it comes to a braai – whether as “krummelpap” with tomato and onion relish, or as a pap tert. So what exactly is paptert? 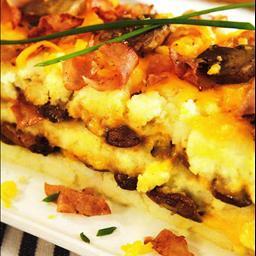 Simply put, it’s a layered dish – consisting of “stywe pap” (thick porridge) and a filling consisting of bacon, mushrooms onions tomato, etc. Don’t forget to rate and comment if you try this! 🙂 Thanks – I’m glad you liked it! If you want to reduce the calories you can leave out the butter in the maize, and opt for ham or any other kind of lean meat instead of bacon. But maize meal is reasonably high in carbs to start with – so not the ideal diet kind of food. Thanks for your message here, strange: your entry was written/published today, but comments left on the 29thAug? Hi, thanks. It’s a new blog and we’re still tweaking things. The article was put on here earlier this week, but republished today. ‘Pap’ is also eaten in the USA! The ‘Southerns’ call it ‘grits’ – google it, is nearly the same as ‘Krummelpap’. They LOVE it too. I found an article on Wikipedia on grits – with a pic. Looks exactly like what we would call “stywe pap” – the same thick consistency needed to make paptert. “Krummelpap” (some people call is “putu pap”) is made with less water and therefore has a crumbly texture – like crumbs. It’s very fluffy. This is a great recipe, i tweaked it up by adding sweetcorn to the layers, and of course once all my layers were complete i then poured a 250ml cream over then topped off with tons of cheese, divine. Just perfect!!! I used course pap and it was delicious!!! Yummy yummy!!! I add a half a tin sweetcorn to the warm water before I add the maize meel. well as paptert with our braais and do not think of it as poor mans’ food. This is a very nice recipe and a gourmet dish.